1. The Creatives are limited to 10 entries each unless YOU give them a score of 3, 4 or 5 stars. Want to see more entries from the ones who are on the right track and giving you some great ideas? They will be limited to 10 entries unless you get in there and give them a score of 3 or more stars. We added the limit to prevent “flooding” and to help encourage Creatives to only submit their very best ideas. 2. The best Creatives take time to explain their entries. 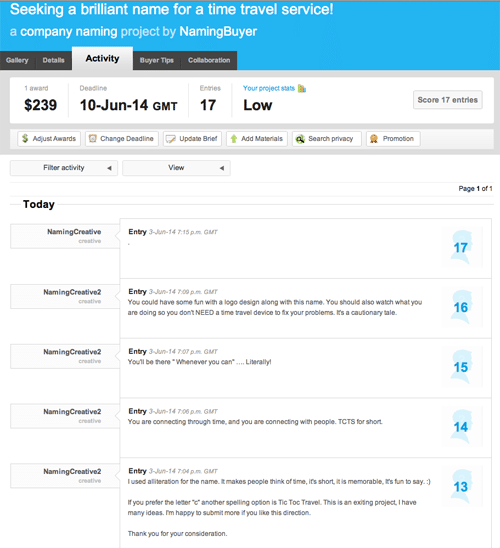 If you want to quickly review the entries that have comments, go to the Activity tab of your project and scroll down. You will see all the comments listed here next to their entry number. If you want to get a quick look at the entry, click on the center of the entry thumbnail. 3. If you don’t like the entries you are seeing, tell them why. If the Creatives don’t hear anything from the Buyer – good or bad – they have no way to know if they are heading in the right or wrong direction. You can post updates to your brief when you want to give general feedback to the crowd. This is also a great way to give them more information about your business that you may have overlooked when you first created your brief. These updates are automatically emailed out to all of your participating creatives and stay posted on your Details page so anyone new to the project can see your comments. 4. Keep up your activity score! There is a rating at the top of your project. This rating is on display in the Browse tab when Creatives are looking for a projects. A rating of “High” will draw more people to participate, a score of “Low”… not so much. We can’t say it enough – the best way to get a great name is to be active in your project! 5. The magic number is 100. This is your chance to get a bunch of creative minds thinking about your business and brainstorming with you to get a great name. The guarantee is that you will get at least 100 name entries. When you receive more than 100 entries, you waive your right to request a refund. By the time you receive 100 entries, many brainstorming hours have been put into your project by Creatives from all over the world. Most projects will receive hundreds and hundreds of names to choose from. Your project has great tools for sorting through your entries. 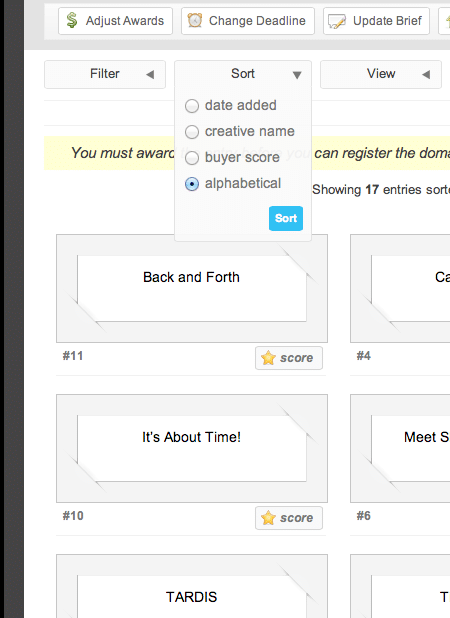 For example, you can organize them in alphabetical order or filter them by star score. 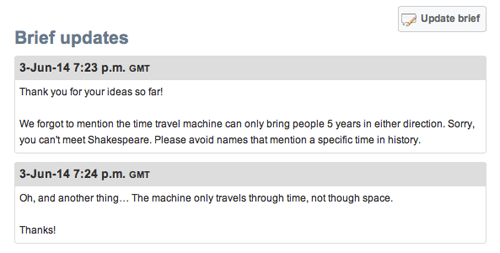 We have some amazingly talented and clever naming Creatives here on the site ready to participate. The key to a successful project is being a part of the process! As always, if you have any questions our friendly customer service team is standing by and ready to help!